Simple questions can show the absurdity of psychic claims. Why are there still missing children? Why are there unsolved crimes? Why do you never see "Psychic wins lottery"? And, added to the list, If everyone else figured that Robbie Thomas' 'Paranormal Convention' was going to fail, why couldn't the 'Psychic' himself, see it coming? Robbie Thomas (who is clearly not psychic) had scheduled his "Can-Am Parafest" for this coming weekend but, as we all suspected, it has been canceled. 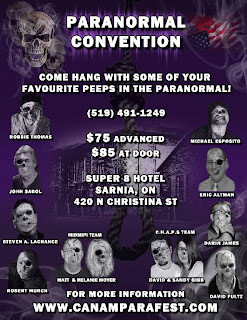 This is the third time that Robbie Thomas (who is not psychic) had attempted to put on a "convention" or "fest" and the first two had such dismal numbers that when SarniaSkeptic attended he increased (by percentage) the number of attendees by double digits. Sadly, for believers, self-styled Psychic Robbie Thomas will continue on pretending like he has never had a failure and encourage people to hand over their hard-earned money for some lame party tricks and false hope. In more than 18 years, Robbie Thomas has never solved a crime using his claimed 'psychic' powers because Robbie Thomas, like everyone else, is not 'psychic'. In the words of Tim Minchin, Robbie Thomas is either lying or he's mentally ill. So, if you meet Robbie Thomas and you think he's sincere - the latter might just be the only possibility.